"Below the 40th latitude there is no law; below the 50th no god; below the 60th no common sense and below the 70th no intelligence whatsoever." The Antarctic region (see maps) was originally discovered in the 18th century by seal hunters working the ice shelves off the continent's coast. The most notable of these was an American, Nathaniel B. Palmer – whose name is given to both an American base (in Palmer Land) and an oceanographic boat. The first to actually set foot on Antarctic ground was also an American, John Davis, who landed there February 7, 1821 (in the Antarctic Peninsula – across the Drake Passage from the tip of South America). Nearly twenty years later, the French were to make landfall on the same continent at its opposite side, across the Southern Ocean from Tasmania. Jules Sébastien César Dumont d'Urville, born 1790 in Normandy, France, commenced his career as a specialist in botany and linguistics. However, on completing his studies at the Lycée de Caen, he joined the Navy, serving aboard the "Aquilon" as a novice in 1807, and as an aspirant in 1809 on board the "Amazone". D'Urville was eventually promoted to Lieutenant de Vasseau in 1821, subsequently embarking on two decades of exploration to Western Australia, New Zealand, and eventually the Antarctic. The purpose of these expeditions was ostensibly for scientific research – collecting botanic specimens, as well as the possible establishment of a French penal colony similar to that of the British on Australia. France was intent on gaining a foothold in the Pacific, and d'Urville's proposal to French naval authorities for a second circumnavigation of the Pacific was approved in 1837. This time, his expedition would involve two ships, the "Astrolabe" and the "Zelée". Setting sail on September 7, 1837, the ships stopped off at Staten Island before passing by Le Maire Strait (off the tip of southern Argentina). It was not long before the Astrolabe and the Zelée found themselves in the icefields of the south, near Clarence Island. Though d'Urville had received orders to navigate the Antarctic area, bad weather, ice fields, fog and snow eventually obliged him to turn away before the end of Antartica's short summer – instead heading for the South Orkneys (800 mi./1290 km SE of the Falklands, on the Scotia Sea), where the ships stopped at Saddle Island. After long navigation around the Pacific Islands, calling at various ports such as Guam, Tahiti, Tonga and Java, the French arrived at New Holland (Australia), where the ships laid anchor on February 27, 1839. During the following months, d'Urville resumed navigation around the islands of Indonesia, waiting patiently for the Antarctic summer to return. In mid-January 1840, the Astrolabe was back in Antarctic waters once again. On January 20, 1840, d'Urville succeeded in raising the French flag over land which he took in the name of the King of France, naming it the Adélie Coast after his wife Adèle. The visit proved to be short-lived, however. After a few days of intense scientific work, and driven out by the bad weather, the two boats set out towards Hobart (Tasmania), then returned to France. No one could have anticipated that another 110 years would pass before the French would once again set foot on the Adélie Coast. In fact, it was nearly 50 years later, in 1897, that the Belgian explorer Adrien Victor Joseph de Gerlache and his crew on board the Belgica landed and – quite unintentionally – spent the first winter stranded there. More than a century after d'Urville's discovery, the French established their first base, Port-Martin (1950-1952), near the glacier of Zélée on the Adélie Coast. 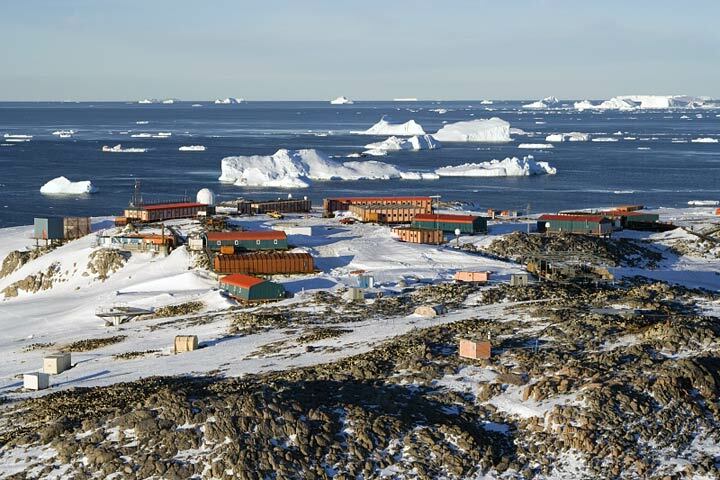 Terre Adélie, a narrow strip of land which runs from the coastline directly to the South Pole, is still a base for French scientists today. The Magnetic Pole – nearly 1700 miles (2700 km) away from the geographic South Pole – is located just offshore from Dumont d'Urville, a meteorological and geophysical research station which has been manned since it opened on 12 January 1956. The region of Terre Adélie is officially part of the French Southern and Antarctic Territories – Terres Australes et Antarctiques Françaises (TAAF), which also includes Kerguelen Island, the Crozet Archipelago, and the islands of Amsterdam/St-Paul. (1.) National Geographic presentation on antarctic penguins and their survival rates in face of global warming. (2.) 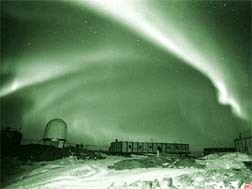 One of the most impressive Aurora australis (Southern Lights) displays ever seen over Dumont d'Urville Base; filmed by Olivier Rey (August 2006). (3.) Glaciology measurements are taken near Concordia Base on the Antarctic plateau, allowing researchers to predict sea levels. (4.) The raid (equipment convoy on sleds) from Dumont d'Urville to Dome C at Concordia Base, 1100 km inland (December 2009). (5.) View of Dumont d'Urville Base, as seen from the air in an arriving helicopter transport (November 2008). (6.) Movie preview for "Journal d'un Hivernant à la Base Dumont d'Urville" (Journal of an Overwinterer...), a film by Jonathan Zaccaria (available on DVD; English or French soundtrack). (7.) Movie preview for La Marche de l'Empereur (March of the Penguins), directed by Luc Jacquet, filmed at Dumont d'Urville (2005). Sources: Discovery - New Zealand in history, ©2000 Grolier Interactive Inc. – All Rights Reserved. Bibliography: John Dunmore, French Explorers in the Pacific; Leslie G. Kelly, Marion du Fresne at the Bay of Islands. 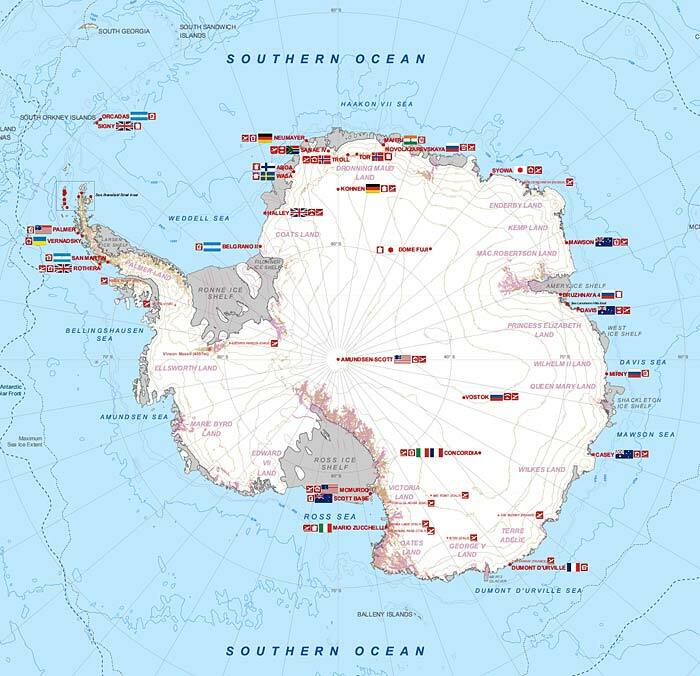 Images: Map of Antarctica © Lonely Planet. 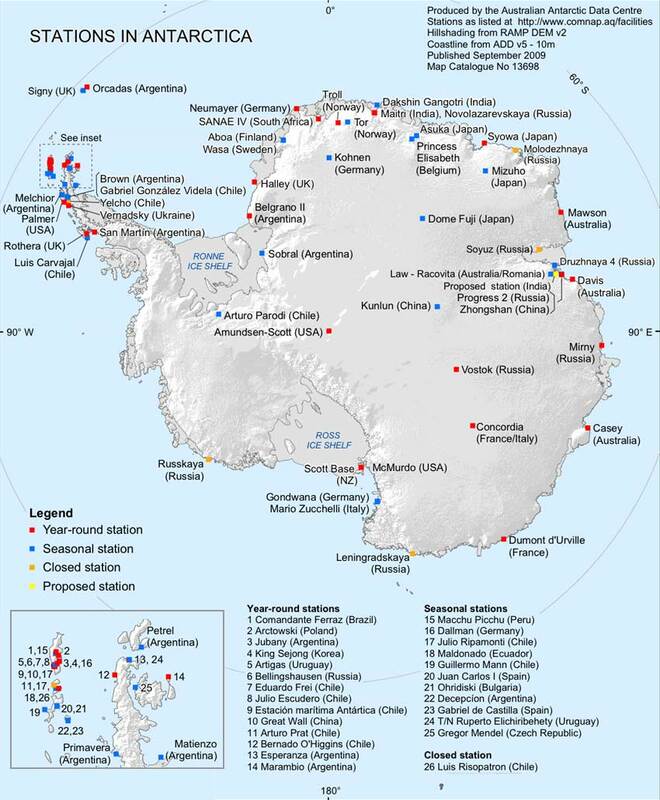 Map of Antarctica showing international research stations, from COMNAP, the Council of Managers of National Antarctic Programs. Larger map of Antarctica showing international research stations, from SCAR, the Scientific Committee on Antarctic Research. (1.) Aurora Australis above Dumont d'Urville, (2.) 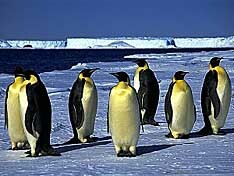 Seven penguins loafing on Antarctica, and (3.) 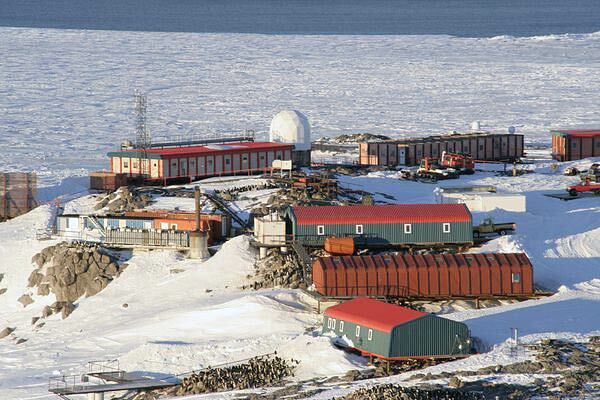 Base at Dumont d'Urville, from Guillaume Dargaud Photo Gallery and Pictures of Antarctic Bases © 1992-2002. Lightbox gallery images: Base at Dumont d'Urville, Samuel Blanc (photographer, 1 Dec 2005), from Wikimedia Commons. Base at Dumont d'Urville, Katell Pierre (photographer, ca. 2006), from IPEV (L'Institut polaire français Paul Émile Victor). All Rights Reserved. The Association Amicale des Missions Australes et Polaires Françaises (AMAPOF), based in Orléans, France, offers a gallery of wonderful photos, including several interior shots of the facilities at Dumont d'Urville, plus detailed maps of the complex. In French only. South-Pole.com provides a detailed biography of Dumont d'Urville, including information on the French naval expedition of 1837-1840 which took the Astrolabe and Zelée on a voyage around the world. Helpful statistics on the region's background, geography, people, government, economy, transportation, military, and transnational issues. 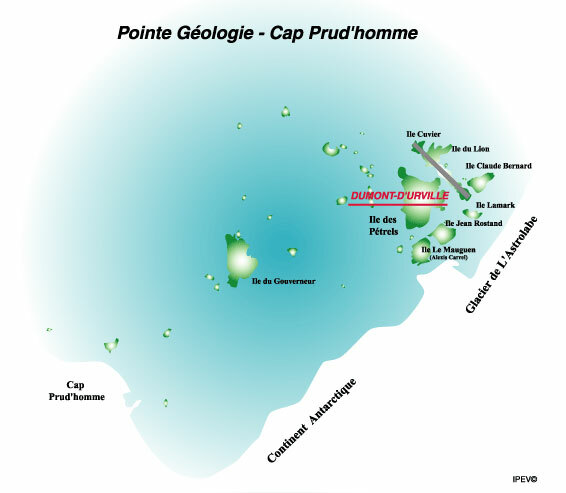 IFRTP (Institut Français pour la Recherche et la Technologie Polaires) provides this handy map identifying Dumont d'Urville (on Ile des Pétrels) and a number of its neighboring islands. The non-profit, human-compiled database provides useful links about the French Southern Territories, in both English and French. Believe it or not, the sale of unique collectible stamps depicting exploration in the Terres Australes et Antarctiques Françaises constitutes one of the most significant revenues for this French territory. J. L. Araignon offers a view of many stamps and postmarks from the TAAF, as well as a collection depicting maritime themes from other nations. Guillaume Dargaud has assembled hundreds of climbing and polar quotes, which are alternately humorous and edifying, underscoring the plight of those who are subjected to Antarctica's rigors. Apsley Cherry-Garrard's amazing tale of life in the Antarctic as the youngest member of Robert Scott's fatal expedition. Provides a gripping narrative about the terrible hardships endured by the people who embarked on this 3-year trip. Doris is an antenna relay system which transmits meteorological measurements (humidity, barometric pressure, temperature) from remote locations around the world. This page offers multiple photos of the installation at Terre Adélie, and details the equipment's technical specifications. The Weather Underground provides a week's forecasts for Dumont d'Urville (brrrr! ), plus astronomical observations and weather-related photos. See also: conditions for all Antarctic stations. Do you know about a great site we should list here? It can be devoted to any aspect of historical French colonization (people, places, events), or contemporary locations still administered by France  collectively known as DOM-TOM (for départements/territoires d'outre-mer). Please use our convenient Submission Form to send your suggestions!